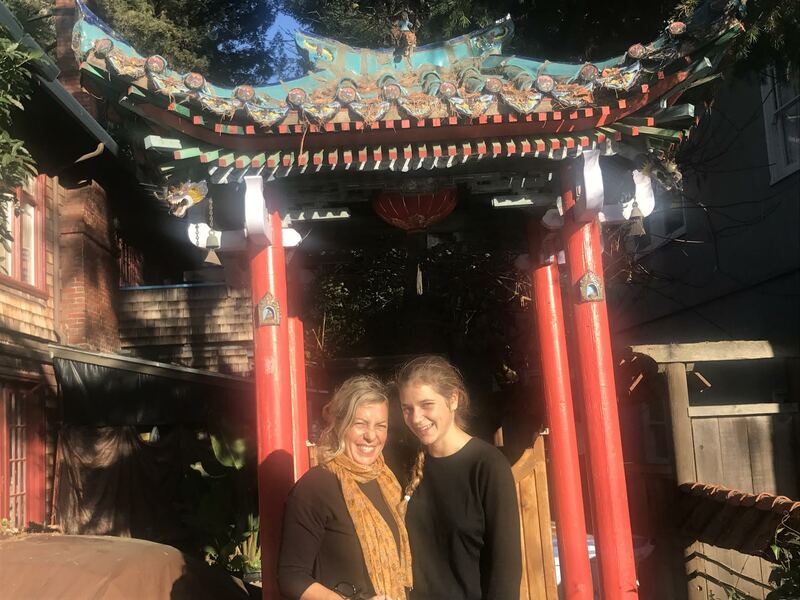 On Sunday, October 29, I took Asia From Italy (see my semi-private post about her year at Berkeley High last year) and her mother Silvia Visiting From Italy on a Quirky Berkeley Tour. 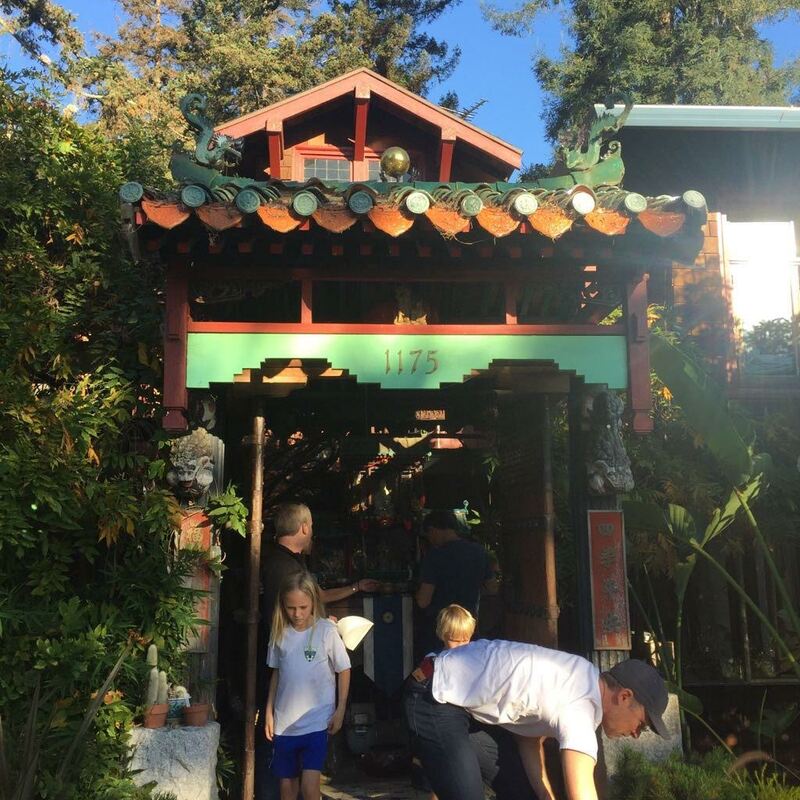 We went to Frederic Fierstein’s Buddhist shrine on Arch Street north of Eunice, as I had done with Asia’s Farther Visiting From Italy last spring. I took their photo – not a great photo but the spirit is there. At the peak you can barely see the monk riding on the back of a tiger. A multi-generation family – shown at the top of the post – was at the altar. Not a great photo but the spirit is there. I started talking with them. The grandparents had devised a treasure hunt, complete with numbered envelopes, texting for the next destination, and a Grok Bag. A few seconds into the conversation it was clear – the treasure hunt was based on Quirky Berkeley. They and seen Eni Green’s doxies on Harper,and had met her. They had seen Peter Mitchell’s insects in a kiosk on Cedar. There were specific instructions for each stop – what to see, what to do. Here it was sweep the tiles and light incense and make an offering. Next stop for them was going to be Buldan Seka’s giant ceramic freaks on Spruce. 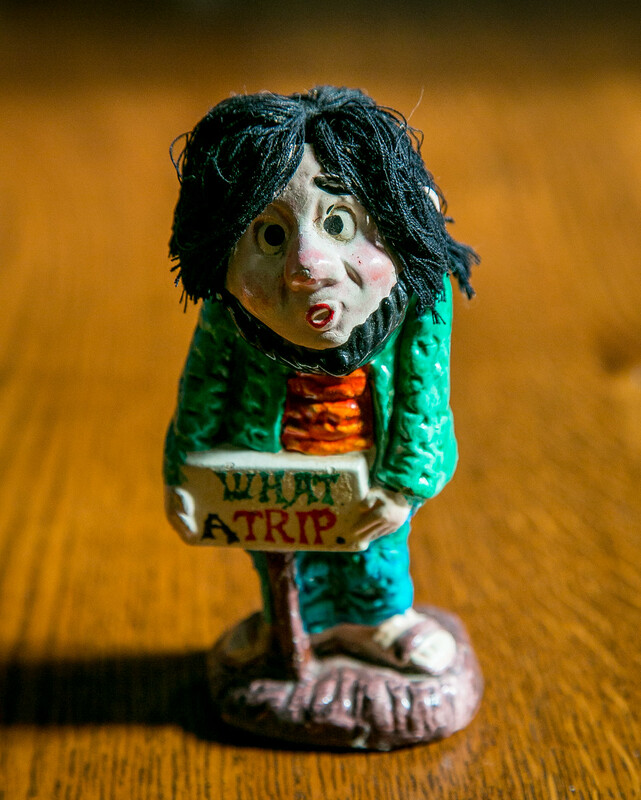 And the grok bag – extra credit! “Grok” comes from Stranger in a Strange Land. It means “to understand intuitively or by empathy, to establish rapport with.” I use the word in the book. Extra credit! What a completely totally absolutely wonderful thing! But I didn’t get contact information. This treasure hunt is perfect, just perfect. It cries out to heaven to be shared. If you are these people – write me. If you know these people – ask them to write me. My friend headed of to read Stranger in a Strange Land for the umpteenth time upon mention of grok. He knew I would ask him about the post so he answered before I asked. I don’t know that family (sorry), but have a hint that might or might not help: that young lady plays recreational soccer for East Bay United, and must have had an away game that day. If my arm were to be twisted about it, I’d guess she’s on a U10 or U12 team. I hope we’ll get to hear more about the treasure hunt… I’d love my kids to play if it ever gets replicated and shared. A Quirky Berkeley tour! What a fabulous idea!